Soil washing is a remediation technique used to remove plant waste products from contaminated soils. If you have a project, please Contact Us to speak to a Hazen Engineer. Recovery of lead, plastic, and ebonite from soil at a CERCLA battery-processing site. Decontamination of high-clay soil, using a proprietary organic solvent. Concentration of soil radioactivity into the fines fraction. Removal of uranium from mixed waste. Removal of organic chemicals from steel plant waste. Construction and operation of a mobile soil-washing pilot plant. Concentration of petroleum hydrocarbons into fines feed for a slurry bioreactor. Removal of chromium and other RCRA metals from soil. Most hazardous-waste studies at Hazen are conducted under treatability exclusion 40 CFR 261.4(f). Hazen has fulfilled all Colorado Department of Public Health and Environment (CDPHE) notification requirements and has received authorization to perform these studies. All treatability studies are subject to sample size limitations. For most soils and debris contaminated with characteristic and listed hazardous wastes, the maximum sample size is 10,000 kilograms per waste stream. Exceptions are the samples identified as extremely hazardous P Code wastes, which are limited to one kilogram per waste stream, and D Code and K Code wastes, which are limited to 1,000 kilograms per waste stream. For those hazardous-waste projects requiring larger sample quantities than are allowed under the treatability exclusion, Hazen can request an RD&D permit from the CDPHE. A separate permit application is made for each specific project. Studies involving hazardous waste that require an RD&D permit can use a much larger quantity of sample, but the regulatory requirements are more stringent than those for the treatability studies. Hazen has been permitted by the U. S. Environmental Protection Agency (EPA) to conduct research and development tests to treat media contaminated with polychlorinated biphenyls (PCBs). Hazen has been issued a Radioactive Materials License by Colorado, a Nuclear Regulatory Commission (NRC) Agreement State. This license, Colorado Number 77-02, allows the transfer, receipt, possession, and use of certain radioactive materials. Hazen adheres to the air emission requirements for research and development activities set forth by the State of Colorado Air Pollution Control Division. One method for soil remediation is soil washing. 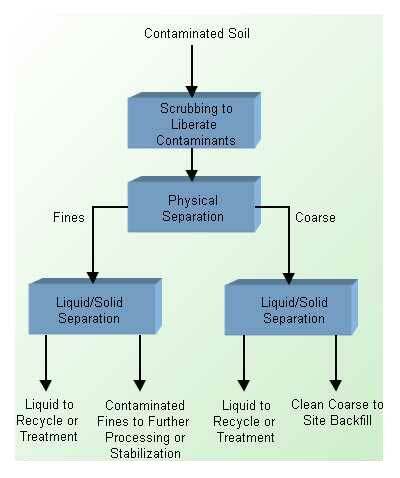 As illustrated in the flowsheet below, soil washing supplies mechanical energy and water to liberate contaminants from the surfaces of soil particles, and separates the more highly contaminated fines from coarser soil particles to reduce the volume of material requiring further treatment. Definition and determination of the chemical specification and contaminant distribution through the soil, contaminant and soil interactions, contaminant mobility/leachability, and soil composition (chemical, mineral, and particle size distribution). Physical and chemical separation technologies currently applied in soil washing. Material handling of solids, soils, slurries, sludges, and clay matrices. Process engineering to translate the results of laboratory and pilot plant test results into viable commercial concepts and designs. Specialty process equipment selection and fabrication for the environmental remediation industry, specializing in transportable and modular equipment. A sample flowsheet to treat fuel-contaminated soils is shown below. 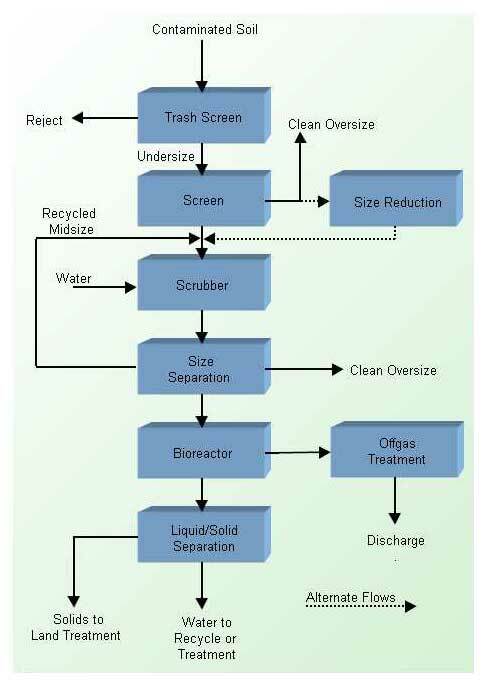 In this method, microorganisms are used to degrade the contaminants in a bioreactor. Mineral processing unit operations include screening, crushing, scrubbing, fine screening, thickening, and filtering. The circuit produces feed for a slurry bioreactor followed by prepared-bed land treatment. Applying these technologies to environmental problems requires an understanding of the laws and regulations governing the treatment and handling of hazardous wastes. Hazen continually trains its personnel so that they stay knowledgeable and remain up to date in this rapidly changing environment.